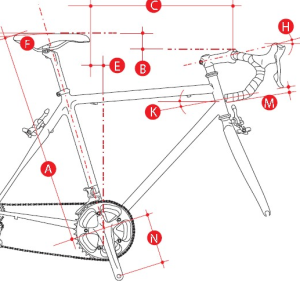 The following is a specific and extended description of what is entailed in a bike fit. This is used with permission from the gurus at BikeFit.com. Illustration 1 – Road Bike with the “target” connection points highlighted. 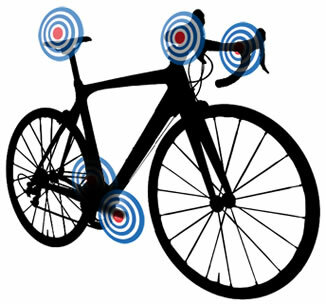 As long as you get the equipment within the bull’s-eye (range) you can achieve a proper and efficient bicycle fit. Keep in mind selling bicycles is the business of a bike shop so it is inherent that their focus is on the bicycle and bicycle frame. 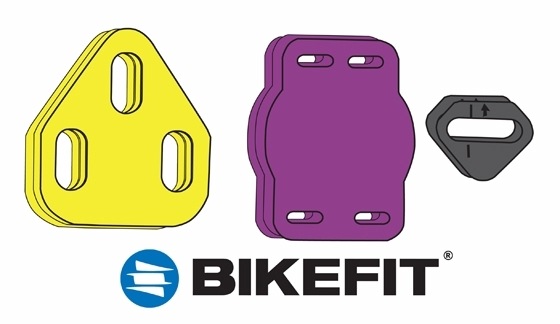 BikeFit focuses on a great bike ride and our business does not rely on selling you a bicycle. Our unique position enables us to give you a non-biased opinion on the brand (or cost) of bicycle you ride. We just care that your bike fits you. Getting the connection points into the bull’s-eye is just a start to the bike fit. Not only do these points need to be in the correct area but you need to fine tune each specific connection. 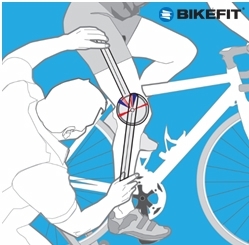 You need to assess and fine tune the bike part as it meets your body. Why? Bicycles are symmetrical (other than one crank sometimes being a little wider-from-center than the other) whereas the human body is not. For example at the hands, just because you may have the correct length and angled stem does not mean you have the right shape and size of handlebar, the proper bar tilt/rotation, and/or brake levers and their location on the handlebars. Or for the feet, because you set the cleat fore/aft position does not mean its rotation, tilt and stance width are correct. The ultimate result between the bike and your connection to it is when the bicycle basically disappears. Once you no longer notice the bike and the only thing on your mind is your ride, the scenery and/or company then you have a good bike fit. Similarly while a bike racer may not care about the scenery, they do care how fast they are going and their position in the field. When a bike racer is not conscious about their bike (it disappears) they are experiencing a great bike fit. Pelvis – saddle selection, height, fore/aft and tilt and sometimes cycling shorts. Hands – handle bars, brake levers and hoods which are connected via a stem. Feet – pedals, cleats, cycling shoes and occasionally crank arm length. Rarely do bicycle fitting articles mention saddle selection with regard to bike fitting. The reality is it is the first step before making any adjustment to the seat height, tilt or fore/aft. Not having the ideal bike seat can affect and compromise your ideal cycling position. As simple as it sounds, the best way to find the most comfortable bike seat is to sit on it. The problem is switching saddles is both time consuming and difficult. Changing a saddle can take up to 15 minutes per seat which means most people make a seat choice by pressing a finger into it to test its firmness or softness. Another option is simply choosing a saddle based on the one that is most advertised. It may come as a surprise that the seat you currently ride is not really the best saddle for you. Let your hiney be the judge! Beware of other ways a bicycle dealer may guide you in your saddle choice. Some bike shops may have you sit on a device that takes an impression of the width of your sits bones. If this device actually works, the best information it ‘suggests’ is – how wide or narrow of a saddle you ‘might’ like. Unfortunately we can share with you story after story where this device does not provide information for a good saddle choice. As mentioned, a saddle that is not right for you can compromise your position on the bike and of course be uncomfortable. Click here to see just how much a difference in saddle choice can make. As you try and find the right saddle keep an open mind. Most shops will start you down a saddle choice path by pointing out that saddles are specifically designed for men and women with most women’s saddles being wider towards the rear (no pun intended). However, some men find certain “women’s saddles” are the most comfortable and conversely some women find “men’s saddles” to be the most comfortable. It’s worth taking a ribbing by your riding mates as long as you are truly comfortable. Are seats with a cutout good? It depends. It seems that in the past some seat manufacturers added a cutout to make up for their less-than-ideal saddle design. Many saddles did not offer the ideal support in the right area even for bicycle racers who ride extremely bent over or a forward-flexed triathlete. A good-fitting saddle may not need a cut out if the support is in the ideal area for you. Where is the ideal area? It varies from person to person but in general, for most of us (male or female) it means not too much pressure in the front or in the center of the saddle. Ultimately a cut out seat may prove the most comfortable but don’t discount those saddles without a cut out before trying them first. You may surprise yourself as to which feels best. Is a level saddle the best position? It may be ideal for some but probably not every road cyclist. A lot of people tilt the saddle nose down thinking it will aid their comfort. If you must tilt the nose down more than a few degrees you may not have the right saddle and/or the overall bike fit is too far off. Too much downward tilt usually results in your pelvis sliding forward. This leads to hand, elbow and tricep discomfort or shoulder pain. While not as common, some saddles feel better with a slightly upward tilting nose. The best adjustment for your road bike seat really depends so don’t get hung up by someone saying it is “supposed to level or slight this way or that way” but rather adjust to what feels best. The starting point for most bike fits is typically saddle height. Sit on the saddle with one leg hanging free and your pelvis level—not one hip tilted higher or lower. Your hanging leg’s heel should just scrape or touch the pedal when the pedal is at the very bottom (6 o’clock). Once you slide your foot back to bring the ball of your foot to the center of the pedal you should have a slight bend in your knee. This is applicable for a road bike or an indoor cycle like the Spinner. 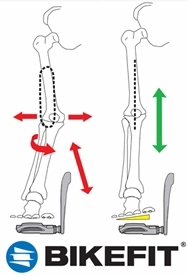 In our experience the properly bent knee should have between 27 and 37 degrees of flexion from a straight leg. 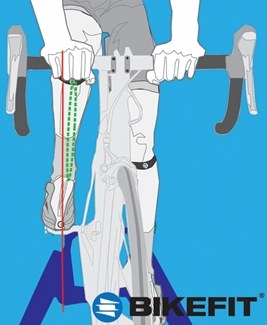 Typically, most people have greater than 30 degrees of knee bend at the bottom of the pedal stroke. If your hips rock a little when you pedal, lower the saddle a couple millimeters and test again. Repeat as necessary until you eliminate this rocking. While there are formulas that take into account your inseam measurement, generally, they do not produce any better result than the aforementioned heel scrape method. Can a saddle height be set to the exact millimeter? It is worth noting that saddle height is never the same even for the same person. What do we mean by this? What happens if they wear a different pair of cycling shorts? That precise measurement is now not so precise. Does the “millimeter measurement” account for the wear and tear of riding a saddle for a long period of time? What if the rider feels tight one day, rested the next day, or they wear additional clothing to accommodate for cold weather? The list is nearly endless. Bottom line: the millimeter adjustment is not as important as you might believe. For years the common thinking for saddle fore-aft positioning was determined by the knee over pedal spindle (KOPS) positioning. The KOPS fit is done by placing one foot forward (3 o’clock) with your crank arms parallel to the ground and then insuring the forward knee cap is just over the center of the pedal (see picture below). For some riders this method may work well enough. This measurement is the same if you use an indoor cycle like the Spinner Pro or road bike. Many people use a plumb bob for this measurement (we did at one time) but we have found a laser to be easier and far more precise. While the right leg in the photo above is closest by using a laser the rider can spin the other leg forward and check the fore/aft on far leg as well without moving the laser. This is not possible with a weighted string hanging from the knee. KOPS is a starting point. Less experienced fitters may rely on KOPS as their only method. More experienced fitters also consider the rider’s overall front-to-back balance. The goal for saddle fore/aft is for ideal front-to-back bike balance and weight distribution. If you feel like you could pop a “wheelie” if a strong head wind hit your face you are likely too far back on the bike and thus need to move the saddle forward. If you feel like you are completely on top of your steering with a lot of your weight on the front wheel you are probably too far forward on the bike. One of the common misconceptions is that you should not have any weight on your hands. That is not correct. It’s true you don’t want too much weight on your hands, wrist and triceps so they tire easily and/or become uncomfortable after some period of time, but the pressure should be “slight.” Decreasing hand pressure sometimes can be achieved by moving a saddle towards the rear (or if the saddle nose is tilted downward you would need to raise the saddle’s nose). Handlebar positioning is a mix of the bar’s height, depth and width, and brake type and position (and occasionally the lever’s reach). The position can be changed by increasing/decreasing the length and height of the stem, the width and reach of the handlebars, and the fore/aft and inward/outward position of the brake lever hoods. Generally your hands should be placed in whatever position you most frequently ride. 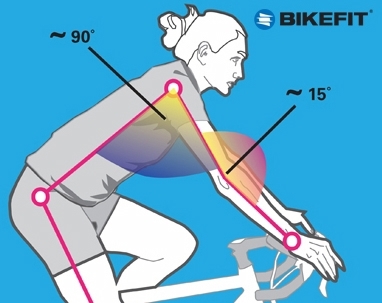 The most comfortable position for most road bike cyclists is where the angle between the torso and the upper arm is around 90 degrees (see illustration below). You should have a slight bend in the elbows to maximize comfort and control. This bend can increase if you want to become more aerodynamic such as when time-trialing, racing or riding into a really strong head wind. Once you’ve found your sweet spot you can begin adjusting your position. Don’t forget to move your hands around on the bars to try different positions. Also, you need to stand comfortably to accommodate climbing or sprinting out of the saddle. If you ride more upright, the angle at the shoulder may be less than 90 degrees. This <90 degree angle applies to road bikes, touring bikes, Spinner Bike, and stationary bikes such as the LeMond RevMaster. Comfort should be your guide when adjusting the height of the handlebars. The road bike racer typically has the top of the handlebars below the seat height. For non-racers the top of the bars may be even with the saddle or even higher. An adjustable stem is really the best way to find your ultimate, comfortable handlebar position. If someone says adjustable stems aren’t worth it, push back. We asked several bike fitters to give their expert opinion on the proper stem a couple of years ago. We began by showing them a number of different cyclists. Of the eight fitters we asked, six of eight failed to recommend the proper stem length the rider ultimately chose after utilizing a sizing stem. Not once did more than two fitters guess the desired stem for the rider. This test was only for length—we didn’t ask about the stem’s height or angle. Finding the right stem is challenging (and sometimes expensive) to do by yourself and is definitely an area where a BikeFit Pro can help you. Net net: if a bicycle fitting expert recommends a stem without testing or trying a few lengths we strongly advise you demand they use a sizing stem or find another fitter. If you really want to try this on your own there are only a few choices for adjustable stems. 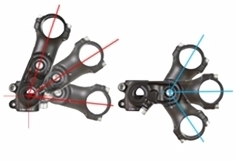 We define an adjustable stem as having more than one axis of adjustment. There are many one-axis adjustable stems that don’t allow for adjusting the stem’s length which is very important. The images above show a two-axis adjustable stem that we recommend as it is both inexpensive and can be used permanently. While this stem takes some practice to adjust, it’s worth the learning curve because it offers many adjustment ranges. Surprisingly, this adjustable stem is only a few grams heavier than a “fixed” stem. Adjustable stems are really useful on a new bike or if you share your bike with friends. Once you find your perfect, desired position you may revert to a standard fixed stem. The easiest way to select the handlebar’s width is to pick up different width bars in a bike shop and grab hold of them. Move your hands around from the drops to the tops. Try both narrow and wide bars. With both hands on the bars move your hands down near your waist, straight out in front of you and then bring them toward your chest. Do this with a few bars and usually you’ll find one that feels better than the others. If you are still unsure between two widths put the bars up to your armpits and choose the ones that are most closely aligned. One of the great advancements in handlebar comfort was shortening the bar’s reach and drop. The reach is defined as the measurement from the part of the bar that attaches to the stem to the furthermost part of the bar (where it bends downward). 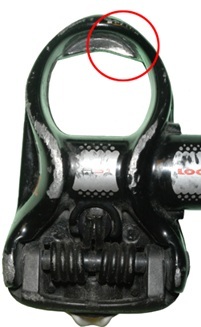 Drop is the measurement of the top of the handlebar to the top of the lower part of the bar (also called the “hooks”). The reach and drop should be comfortable for your riding style. For example, bike racers spend most of their time on the hooks whereas a casual cyclist may never ride in that position. Historically the most frequently used method of determining the handlebar’s rotation was putting the bottom of the drop parallel to the ground or level like the photo on the left. If you walk into most bike shops today may still likely see this. This position is not very comfortable for most riders. The rotation of your bars is determined solely by what is comfortable, not the bar’s alignment with the earth’s surface. Rotate your bars upward until you achieve a more neutral wrist position. Doesn’t the bars rotation in the right photo below look more comfortable? Let comfort be your guide to fine tune this as your body will guide you to the best position. This simple adjustment helps improve hand comfort and reduces numbness. Handlebar height is determined by comfort and the type of riding you’re doing. For example, some cyclists adjust their bar’s height for spending most of the time in the drop position whereas other riders never go to the hooks but prefer riding with their hands on the hoods. Adjust your handlebar height to your comfort. Some fitters use body measurement to determine the handlebar’s height. While a measurement might be useful it should not be used as the sole determining factor. Crank length really seems to be one of the least critical factors in many bike fits; perhaps not all, but most. For most people the cranks that come with the bike are fine. The general rule of thumb is (or has been) if you are shorter use shorter crank arms and if you’re taller use longer cranks. However, the longer the crank, the more knee bending and straightening (extension and flexion). 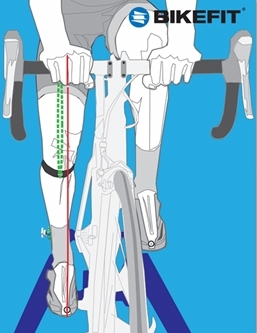 After a good bike fit, if certain issues remain in specific areas on a cyclist then crank length may be considered. This really is quite rare as most good bike fits will take care of most issues. Before spending a ton of money on different cranks it is a good idea to make sure your fit is done as best as possible. Crank arm length is highly dependent on the rider but here is a ‘rough’ guide. If your inseam is under 31 inches you may want to use cranks that are shorter than 170 mm. If your inseam is over 32 inches you may want cranks longer than 170 mm. Or if you really want to extend this guide to include frame ‘size’ you may consider that for a 54 cm frame, try cranks shorter than 170 mm. For frames over 56 cm you may want to try a crank longer than 170 mm. And last, but certainly not least is the foot/pedal connection. 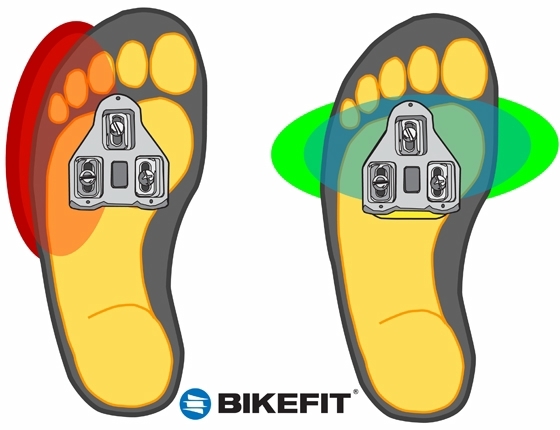 The foot/pedal connection is the most important aspect in any bike fit because our experience shows us that most of a rider’s pain and discomfort actually originates in their feet. 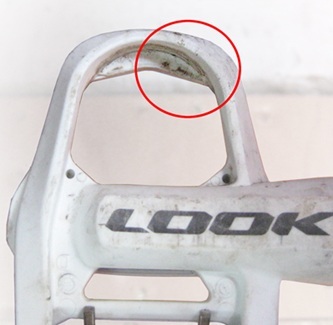 Fore/aft cleat position has changed over the years as cycling shoes have become stiffer. 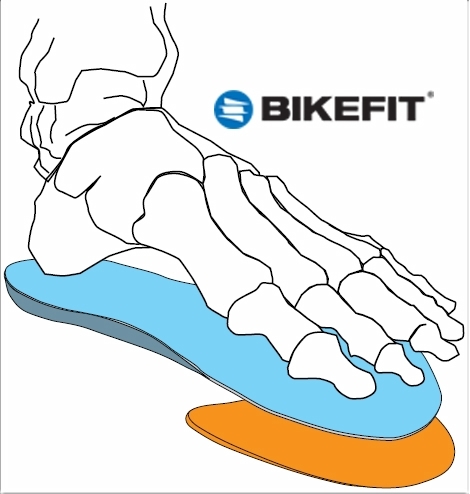 While some cyclists find positioning the center of their cleat behind the ball of their foot (the big bump on the foot behind the big toe # 1) is comfortable, others place the center of the pedal spindle even closer to the bump (back from the pinky toe # 5) on the outside of the foot. 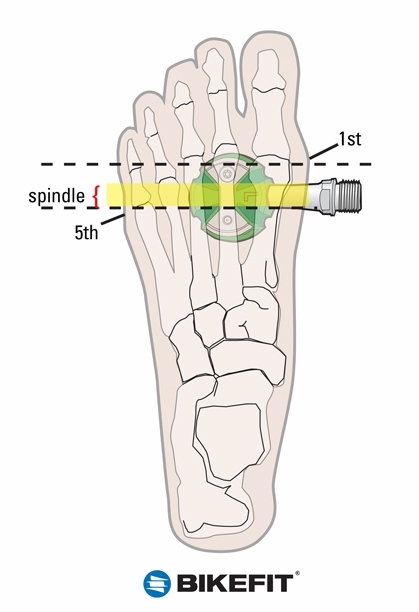 In the illustration to the right the center of the spindle is between the middle of the 1st and 5th but closer toward the bump on the outside of the foot. If you feel strain in your calf or Achilles tendon move the cleat back toward the heel of the shoe. If you feel sore under the arch you may need to move the cleat forward on the shoe. Clinically speaking, side-to-side cleat position is referred to as medial/lateral cleat placement. Medial means toward the inside and lateral means toward the outside. One of the best ways of determining side-to-side cleat position is to look at knee over toe alignment which determines the rider’s stance width. This is one of the most overlooked aspects of a bike fit. Generally, the foot should be below the knee when pedaling. If the knee is outside the foot—see Illustrations 9a and 9b—then you need to move the foot outward by pushing the cleat inward. If the knee goes inward when you pedal then the foot needs to be moved inward (cleat moved outward) as well to be more under the knee. Not all cleats allow for side-to-side adjustment. If you have adjusted the cleat as far as possible but you are still not out or in far enough you may want to consider pedals that have different length spindles such as Speedplay. Or, you can move the foot wider by adding a spacer washer or a 20 mm spacer. In the illustration below, the top pedal shows the 20 mm spacer threaded onto the axle to increase the width/length of the pedal. The bottom pedal shows a 1mm spacer washer over the threads of the axle to increase the width/length of the pedal. Never use more than one 1 mm washer on a pedal spindle. The 20 mm spacers are often a good solution for the cyclists that look like a v-twin engine while pedaling with both knees outward at the top of the pedal stroke. If you are one to pedal with your knees out you may have heard other riders tell you to “bring your knees in.” This is another cycling myth. The reality is your knees go where they want to go and you need to move the foot underneath the knee to accommodate that natural motion. 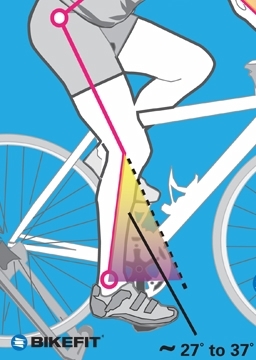 The tilt and angle of the forefoot is very important and is one of the most overlooked aspects in bike fitting. The most common “hot spots” (your foot feels like there’s a flame underneath it) are resolved by a simple tilt adjustment where the cleat/shoe meet. Not a week goes by that someone doesn’t call or email us complaining of discomfort or pain on the bottom, outermost part of their foot. The left illustration shows the location of the MOST common “hot foot” or foot discomfort. The right illustration shows even pressure the cyclist should have across the entire ball of their foot. Cyclists often describe this as feeling better connected, more stable, even-feeling and so on. There is a way to look at your own feet and see why there is often more pressure toward the outside of the foot. With your knees on a chair have someone hold a book or ruler across the balls of your feet. Are they angled up toward the inside or up at the outer part of the foot? If so, we have a solution. 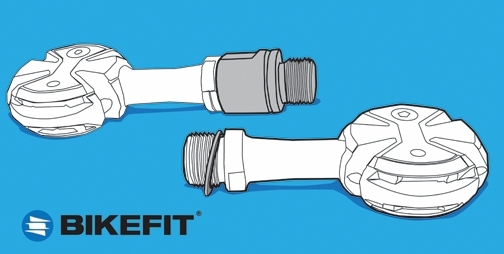 We have a product called Cleat Wedges® that accommodate your foot’s natural position by creating an angle on your cycling cleat(s) where it connects to the pedal. It’s worth noting that the number of Cleat Wedges on one shoe in no way dictates the proper number of Cleat Wedges you’ll need on the other shoe. Another indication for needing Cleat Wedges is if your knee dives inward on the downstroke as illustrated below on the leg with the red arrows. It is biomechanically better to reduce the inward dive as it increases your efficiency by reducing excess side–to-side movement. The leg on the right shows the “after” of Cleat Wedges installation. There are 3 types of Cleat Wedge—2-hole, 3-hole and 4-hole—which correspond to the type of cleat system you are using. Cleat Wedges are designed to match the pattern used to fasten your cleat to your cycling shoe. The 3-hole Cleat Wedge works with Look Keo, Look Delta, Shimano SL road, Campagnolo, Time road and similar 3-hole cleat systems. The 4-hole Cleat Wedge is used with Speedplay X-Series, Zero and Light Action cleat systems. 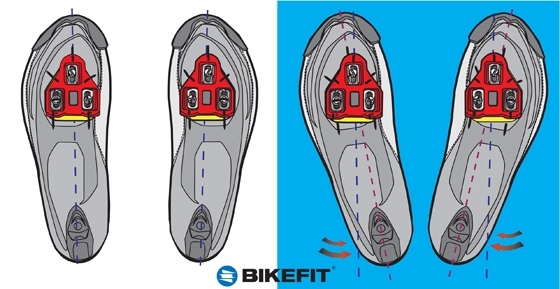 The 2-hole Cleat Wedge (one horizontal slot) is most often used with SPD and mountain biking shoes. Each Cleat Wedge has a one degree slope (or angle) and can be stacked based on your needs. Another good way to determine if you need Cleat Wedges is by looking at the wear on your cleats and/or most pedals. If you use Look road pedals, turn over the pedal to look at the underside and at the front of the pedal’s inner surface or “lip”. For example, in the photographs below notice how the pedal is worn in the area inside the red circle? This is VERY common. It is worn toward the inside because the inner part of the rider’s foot wants to be up higher than the outer part of their foot which you probably saw for yourself when you knelt on a chair. 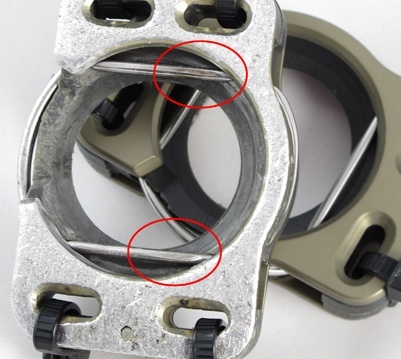 If you use Speedplay pedals and cleats you may notice the wear on the outer part of the spring. It may wear some across but nearly every time the part that is closer to the outside of the foot will show more wear. The cleat on the left is worn and the cleat on the right shows nice round unworn springs. This is because the foot wants to be tilted and is not the fault of the cleat. Cleat Wedges are needed here because they allow the foot to connect at its natural tilt or angle. If you have Speedplay pedals look at the cleat and the inner circle for wear. You will almost always see more wear near the outer part of the circle because 87% of the world’s physique is this way. The clinical term for this is Varus. 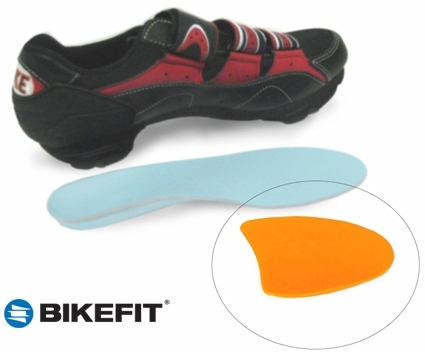 BikeFit originated both Cleat Wedges and In The Shoe (ITS) Wedges® to help address the aforementioned issues. 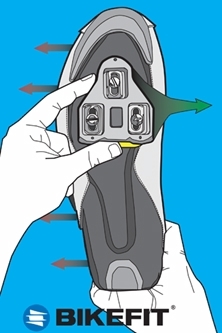 ITS Wedges go inside the shoe, under your shoe’s insole and beneath the ball of your foot as shown in the Illustration 19. Based on our years of experience we have found that Cleat Wedges should be the primary wedging option followed by ITS Wedges. There are several reasons for this including the amount of space in the toe box of the shoe and the fixed position and connection that Cleat Wedges enable. 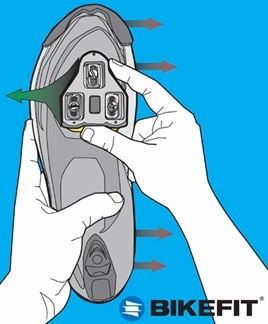 Some fitters may even use ITS Wedges as a way to determine if angling/tilting the foot is more comfortable without having to take off the cleat as required by Cleat Wedges. However, once the comfort is confirmed the first choice to correct your foot’s natural angle/tilt is almost always Cleat Wedges. That is not to say ITS Wedges don’t have a place. They do but usually as a “filler” Wedge. For example if you are already up to three Cleat Wedges but you need more then add an ITS Wedge. If your shoes are very loose (sloppy) and you have a looser foot style (not rigid feet) then an ITS Wedge may be the best choice. Over 90 percent of the population’s feet tilt inward or outward so odds are you are in that percentage. Wedges are the answer! Rotation position on MOST cleats needs to be adjusted even if the cleat is meant to float (e.g. Look’s red cleat). There are exceptions. For example, Speedplay X series pedals do not require rotational adjustment as they have a ton of float built-in and the float is not adjustable. If your cleats allow for rotation then they should be rotated accordingly. In general, the direction your feet point off the bike will be the same as when you are on the bike. Take a look at your feet (or have someone else take a look) while you are walking or standing. You can also try jumping. Once you land take a look at your feet and see where they point. Do they point straight ahead? Illustration 20a below on the left is a good indicator of how your cleats will look on the bottom of your shoe if your feet tend to always point straight ahead. If you are more duck footed (toes out) most of the time you would need to adjust your cleat accordingly and your cleats will probably look more like Illustration 20b on the right. Length issues affect a portion of the population, but it is an involved topic best addressed in its own article (we’ll link to it when we actually write it). 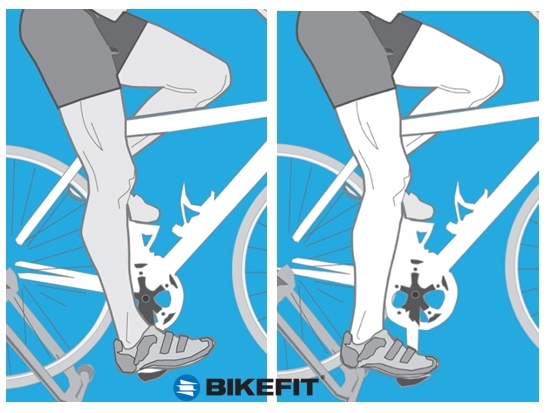 If you are aware or think you may have a leg length issue while riding, it is best to see a BikeFit Pro who is a medical professional. These clinical BikeFit Pros can use X-Rays and other means to truly assess leg length discrepancies. To address leg length discrepancies we recommend using Leg Length Shims. So, how important is frame size? If you will, please allow me to use an analogy. Buying a bike frame is like buying a suit. You’ll no doubt find several acceptable sizes on the rack whether it’s a bike shop or clothing store. Most people won’t purchase a suit and walk out of the store but instead go to a tailor to make the suit fit perfectly. A bike fitter is like the tailor because they work their magic to make your bike fit you like a glove. A lot of people use the new suit as opportunity to complete their wardrobe with shoes, socks, belt, shirt and a tie. You probably see where I’m going with this—the pedals, cleats, saddles, stem, handlebars, etc. are like clothing accessories. A bike frame within your range is probably available and will meet the needs of the vast majority of riders. It’s the bike fitter, proper components and shoes/cleats that determine how well the bike (suit!) fits you. A saddle and perhaps a certain type of seat post can be used to achieve your ideal height and fore/aft position. A properly sized stem (angles and length) to connect to specifically fitting width and style of handlebars are just as important. While nearly everyone initially focuses on the frame, our fit is based on everything but the frame. From our research, most riders cannot tell the difference if a seat tube, fork or seat stay is ½ degree steeper or shallower or if a bike is shorter or longer by two or three millimeters. If the fit has been dialed in most riders soon forget (or no longer care about) the size of the frame. Unfortunately, there are many very expensive bicycles that are not properly fit and which the rider is not comfortable. If you just spent a lot of money on your bike frame it is understandable you may not like the idea of setting up an appointment at your local bike shop to fit you, assuming they have a great bicycle fitting expert. If your shop does not have an expert fitter go to another shop or find a fitter who’ll meet you at your shop. You can find a list of our BikeFit Pros and Dealers here or at the button at the bottom of this article. Our advice: if you think you are one of the few exceptions who needs a custom frame, you may want to get advice and confirmation from more than one fitter. They can prevent you from throwing down big bucks for a custom frame that you might not need as there are a lot of choices in this process and it can become overwhelming at times. While the bike fitter observes you during your fit, how it feels to you is important as well. Only you know how you feel. A fit may look good but if it does not feel right the bike fitter needs to know. If you are not sure how to explain what exactly you are feeling, give the fitter that feedback as it’s still worthwhile information. During our BikeFit Pro education we emphasize that it is the fitter’s job to help you articulate what you are feeling. Sometimes something as simple as a drawing showing the problem area will help you describe how you feel. A competent fitter is not afraid to answer questions and will explain what they are looking at and why they are recommending an adjustment. If your fitter uses motion capture or data capture, remember that the information on the computer screen or print-out does not necessarily show everything. Some of this information may tell the fitter a lot. Other times, the information they need is actually beyond the captured view. It is nice to find a bike fitter that is well rounded and does not solely put the emphasis on the “system” they are using but is able to convey their experience and knowledge. Net net: your comfort on the bike is determined between you and your fitter. It’s the fitter’s job to make sure you are as comfortable on the bike as possible—not to get you ready for a Bicycling Magazine/VeloNews cover photograph. If you search the Internet for bike fitting you’ll find there are many bike fitters (depending on where you). We recommend searching for the fitter’s names, make a few phone calls and interview the prospective fitting experts. Many people claim they can do a bike fit and many claim to be experts. Nothing replaces education and experience. While technology tools can map your image on a computer screen and can assist the fitter, software/hardware alone is no replacement for experience. Learn about the fitter and their experience; not just that they have cool tools and gadgets. Keep in mind if you are getting a bike fit on your own bike, and you are not looking for a new bike, it is OK to make sure the bike fit is done on your bike. It is not mandatory you start your fit on another bike or sizing type bike to then transfer everything back to your bike. Many of you will no doubt run into this scenario and the person selling you may sound good and even apply pressure. I have experienced this first hand and it can be frustrating. Your bike is your bike. 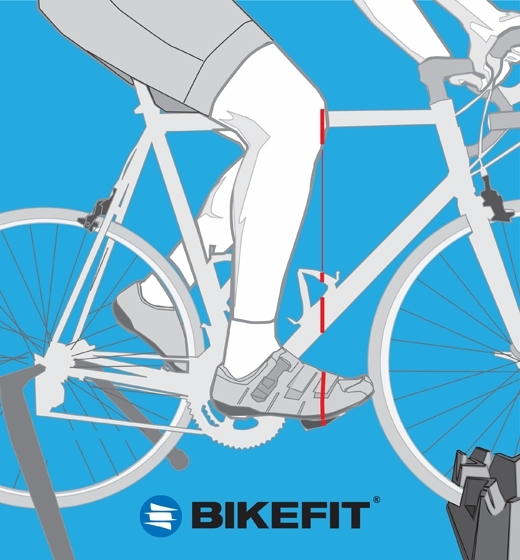 If you are getting a bike fit on your bike, use your bike. If you find your comfort on the bike changes after you’ve left the fitting session, whether it’s been a day or a few weeks, you need to go back to that fitter and let them know. Most fitters will likely make the necessary changes for free or little charge, whereas, they aren’t likely to give you a free refit if you come back three months later. An issue can still creep up down the road. But, if you are experiencing pain or discomfort let the fitter know right away. Getting to the fitter quickly also helps them because your fit will be fresher in their memory. 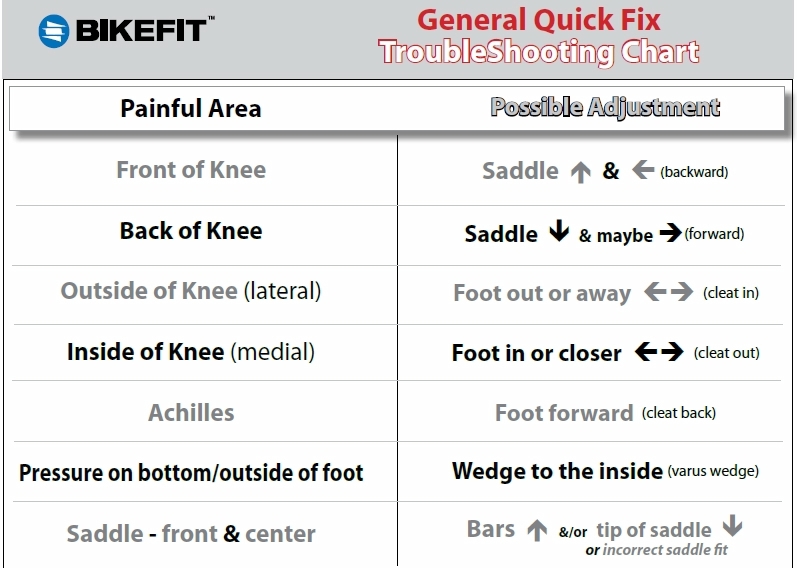 Lastly, we developed the chart below to outline quick fixes based on discomfort and/or pain. If you have an area that is uncomfortable there may be a corresponding adjustment.